Please participate in our temporary user survey – thank you! The project promoted the planting of drought-resistant olive trees. The sale of fruit generates income, thereby increasing the resilience of the local communities. The project provided planting material to, organized training on grafting and budding, and arranged an exposure visit for farmers. Furthermore, the project promoted the use of formerly unutilized mulberry fruit as livestock feed. Through training and practical demonstration farmers learned how to produce mulberry based feed-blocks. In Chitral and Swat districts, climate change adversely affects the livelihoods of the local communities which mainly depend on the services and benefits that the ecosystems provide. With advancing climate change, drought periods will be longer and more frequent. Biodiversity is slowly eroding. In agriculture, local well adapted and resilient species and varieties are disappearing, inter alia due to lack of awareness, propagation of high-yielding varieties, overexploitation of forests and rangelands. There is an acute shortage of fodder for livestock, a situation that is worsened by a prolonged winter / dry season. In the past, the relevant government services have worked in an un-coordinated way, with insufficient communication within and among the departments, and planned their field activities in a top-down manner. Farmers were insufficiently supported in their efforts to adapt to climate change, and to conserve and sustainably manage biodiversity as a basis for their livelihoods. Climate-change adapted plants - Olive ssp. How do the building blocks interact? The systematization of best practices of similar projects (Building Block 1) and vulnerability assessments for integrated bottom-up planning (Building Block 2) laid the foundation for subsequent project implementation. The planned EbA measures were implemented in a participatory manner through a community-based approach (Building Block 3). While using biodiversity and ecosystem services for climate change adaptation of local communities it was of particular importance that the selected EbA measures are climate smart and make use of resilient tree species (Building Block 4). •	The local community in Chitral has learned how to prepare Mulberry fruit based feed-block and knows its nutritional and economic value. The local community is able to use mulberry when fodder availability is lean. •	The production of mulberry fruit based feed-blocks is being replicated by some farmers, and some of them have started marketing the feed-blocks in the area. 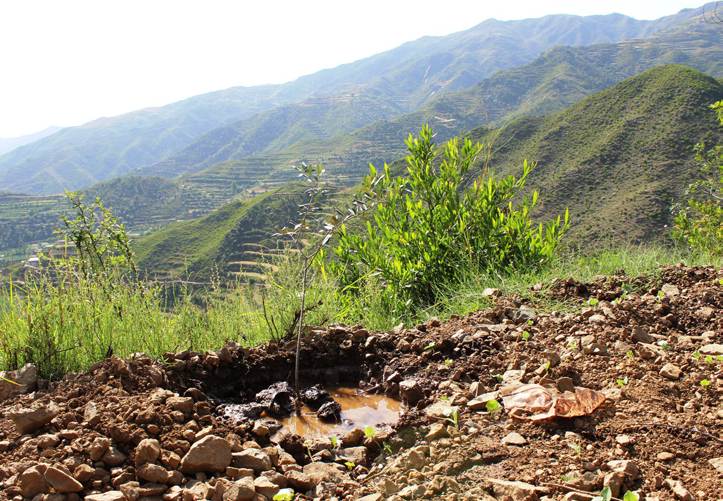 •	3000 high-quality olive tree seedlings have been planted by farmers in Swat. The plantation sites are protected from grazing animals which has increased vegetation cover and has restored the habitat for the local fauna •	The participation in the vulnerability assessments and the subsequent joint planning and implementation of adaptation measures increased the awareness of different stakeholders around biodiversity in general and, more specifically, around the interrelatedness of biodiversity, ecosystem services and climate change. This solution is published in the Ecosystem-based Adaptation portal. Be the first to comment this solution.